Hapag-Lloyd will conduct its tests of exhaust gas cleaning system (EGCS) technology in 2019, the carrier has told Ship & Bunker. And while the firm has yet to make any firm decision on how it will comply with the upcoming global 0.50% sulfur cap on marine fuel, it believes the use of EGCSs, more commonly known as scrubbers, could only be a stop-gap solution. "To comply with the IMO regulations we see three promising options: convert to using compliant fuels, use LNG or use Exhaust Gas Cleansing Systems. We will likely need a mix of all three which also includes EGCS," a company spokesperson told Ship & Bunker. "However, EGCS might be an interim solution only until the availability of low sulfur fuel increases." 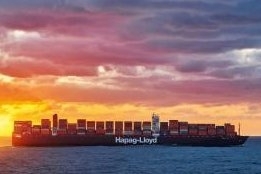 As Ship & Bunker reported last month, Hapag-Lloyd will test the tech on two of its containerships. "To run these pilots we currently talk to potential suppliers and yards. For the implementation of EGCS we will be using two 13,000 TEU ships," the spokesperson told Ship & Bunker, adding that it will also conduct a trial of liquified natural gas (LNG) bunkers on one of its 15,000 TEU LNG-ready ships. "We have not yet made any decisions about how widely to adopt any particular technology."